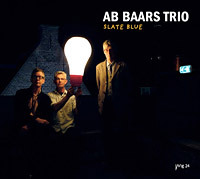 The Ab Baars Trio stands as one of the longest running musical units in the Netherlands. Spearheaded by Ab Baars in 1990, along with fellow Dutch musicians Martin van Duynhoven (drums) and Wilbert de Joode (bass) the ensemble has developed into one of the most thrilling ensembles in modern jazz. Not that the music clings to genre - all three have long and varied musical histories that encompass both the world of jazz and many points on the musical spectrum beyond - even stretching to dance, poetry and spoken word. While a connection between these ventures seems negligible, there is a strong common denominator throughout; the commitment to improvisation. With this emphasis and the endless possibilities it yields, its not surprising that Baars views music as an idiom beyond the reaches of neat-fitting names.